Whether you are laughing it up ladies-night style, leaving the kids at home for a much needed date night, or tapping into your “No sleep ’til Brooklyn” inner Beastie Boy, late night can be a treat. 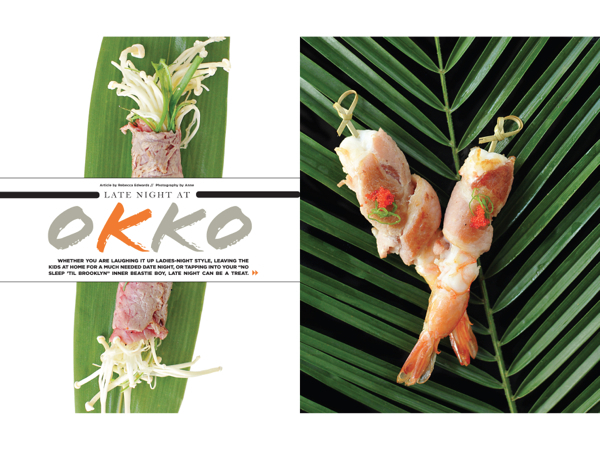 Thanks to OKKO, late night is now a tasty treat. Located in Port Royal Plaza, this Asian-inspired restaurant and bar has a little something for a whole lot of late nighters. From Hibachi group tables to private rooms (one has a flat screen television for presentations and the other is for private parties) to outdoor seating, OKKO can help you get your groove on until the midnight hour. Zhu knows a lot about grooving his way into a successful restaurant venture. His other tasty venue, Asian Bistro on New Orleans Road near the south end of the island, has become a Hilton Head hot spot that also delivers. Though both restaurants offer delicious food, the menus are very different. Think of OKKO not as Bistro’s sister restaurant, but as its hip, metropolitan cousin who listens to Groove Armada or Thievery Corporation and sips sake martinis while lounging back on a posh sofa. To keep the fun flowing all week long, OKKO offers several drink specials. Tuesday night is Ladies Night with $15.99 wine flights from 5-7 p.m. Wednesday night is Martini Night with $5 top shelf martinis. Thursday night is Sake Night with half off sake drinks. And every night you can toast to the day with one of the restaurant’s signature cocktails like the OKKO Saketini—a dangerously refreshing combination of Malibu Rum, Midori Melon Liqueur, Absolut Vodka and Sho Chiku Bai Sake with a splash of pineapple juice—or the Total Zen, a true ticket to chilldom with Ty Ku Soju, Tu Ku Citrus Liqueur and Skyy Ginger Vodka served over ice with lemon-lime soda and a lemon slice. The wine selection is also an integral part of OKKO’s contemporary décor. Walking into the restaurant, a long glass-enclosed wine rack is both functional and aesthetic. 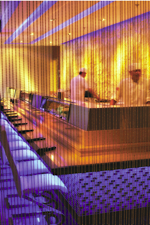 It divides the sushi section from the bar area, and its modern elegance gets you in the mood to sit back, relax and enjoy yourself. With mainly white walls, floor and ceiling, the color palette is clean and modern and made comfy with subtle lounge-y elements like the gray micro suede seating that runs the length of one side of the restaurant, low, well-placed lighting, black lumbar-supporting seats and conversational art pieces. Like the interior, the food is also contemporary. Thanks to Chef King, who has been creating Asian delicacies for over 12 years, the sushi rolls bring on the flavor and the funk. The Bomb Roll is rice-less with lobster tail tempura and crabstick wrapped in thinly sliced cucumber with spicy sauce and eel sauce on top. The Green Devil Roll consists of shrimp tempura, eel, avocado, and cucumber wrapped in soybean paper with eel sauce on top. And the Spicy Girl Roll has spicy yellow tail, cucumber, and crunch inside with spicy salmon and sriracha on top. “Chef King has also brought some innovative small plate dishes to our menu,” Zhu said. Take the Taco Tara. The party begins with the presentation and continues with the cool combination of pepper tuna, spicy crabmeat, avocado, special crunch and balsamic vinegar sauce set atop a tostado. Then there is the Yellow Tail Jalapeno. Buttery Yellow Tail fish is sliced to bite-sized portions and topped with a sliver of jalapeno, the salty pop of black caviar and the mellow influence of a light ponzu sauce. And don’t forget to sample Zhu’s favorite roll, the Tuna Amazing Roll. This moment of silence followed by a low moan concoction includes spicy white tuna, spicy tuna, crunch, and avocado inside with pepper tuna, wasabi sauce and eel sauce on top. Not a sushi eater? Not a problem. OKKO offers Asian appetizers like gyoza and steamed basil rolls, several curries, and a health menu. OKKO’s signature entre is the sea bass. Steamed and then flash fried to create a thin delicate crispy coating, it is a dish to be shared and savored. The chef shows off his knife skills with edible decorative elements like a blooming carrot and demonstrates his culinary mastery with perfectly cooked and seasoned veggies that are accompanied by the taste and texture of fresh basil and slow-cooked edamame. Much of the menu is as healthy as it is scrumptious. There are both gluten-free, low-carb and vegetarian options and sulfite-free beverages. “We can accommodate any dietary need,” Zhu said. Open Monday through Thursday 11:30 a.m. to 11:30 p.m. and Friday and Saturday 11:30 a.m. to midnight, OKKO also caters and will be offering sushi-rolling demonstrations in the future. “We want to be the place locals come to—especially for a late laidback night,” Zhu said. OKKO is located at 95 Mathews Drive, Suite C, in Port Royal Plaza on Hilton Head Island. For more information, call (843) 341-3377.